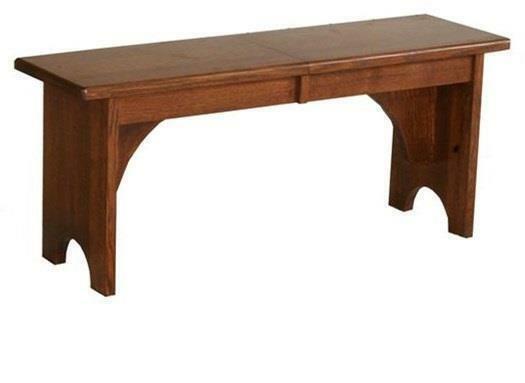 The Amish Hardwood Plain Extension Bench with Two Leaves is anything but plain! This bench beauty brings just the right amount of seating to the table at your fun family functions! With two additional leaves available, this extension bench is ready for large family reunions or super Sunday brunches! You choose the wood and stain to create a bench that reflects your personal style. Consider our Straightback Outdoor Love Seat Bench for an outdoor option! 42" - 84" x 12.5" x 18"
Our order of table chairs and bench were delivered this afternoon. Everything is perfect! We are as pleased as we could possibly be! Please pass along our compliments to everyone involved; from the selection and ordering process to the craftmanship of builders to the helpfulness and proficiency of the delivery crew everything came together nicely. My wife is all smiles and when she smiles, I smile.